I found this on Talli’s blog. You must tell six truths and one lie about yourself. See if you can find out which one is my lie. 1. I have been writing stories since I was six years old. 2. I have never taken a creative writing course. 3. I have my own YouTube Channel. 4. I have a son and two step sons. 5. I have a form of Autism called Asperger’s Syndrome as well as Dysrpraxia and Dyslexia. 6. I’ve always wanted a daughter. 7. I have a BSc (HONS) and have passed several MA level modules. I got this lovely award from Lily. 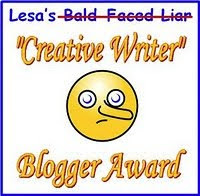 I am allowed to pass it on to ten other bloggers. I’m sad to say that this is the last day of my week’s holiday from work. On a happier note I am going to the London Book Fair on Tuesday to see a publisher about ‘Without Alice‘. He’s said very nice things about my novel so far and although I know that in no way guarentees he will offer me a contract for it I can’t help getting my hopes up. Bluechrome writers who will be there, either to read or just to lend their support are, among others, Ruth O’Callaghan, Patrick Osada, Joe Stein, Sue Rose, Jim Bennett, Patricia Debney, Leah Fritz, Adele Ward, Carolyn Oulton. I can’t make it due to the expense of travelling to London and back the day before but urge you to attend if at all possible. I know a few of these authors and the quality of their writing is exceptional. i’ll be back here on wordless Wednesday and will update you on my meeting with the publisher about ‘Without Alice’ on Friday. No — I can't guess the lie. I'd say You Tube if pressed. Bluechrome did some faboulous work in its day. I'm sorry it went under. Love this quirky post 🙂 Good luck up in London. Thank you for my award, you lovely lady! And, I'm going for number 6.
never taken a creative writing course??? EVERYTHING crossed for you with your publisher meeting. It's very, very, very exciting. Good Luck!!! Hmmm, the lie!! I think it's the creative writing course…you have natural talent!! Thanks for the award! And thanks for mentioning the reading. You'll be sorely missed!! 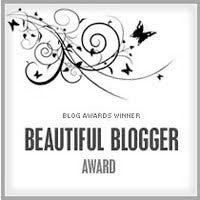 Thanks for mentioning my blog! I'm going to guess Number 2, but I really have no idea! I think the lie is that you always wanted a daughter (although my second choice would be the Maths modules one – only basing that on the fact that I can do mental arithmetic but have no grasp on higher mathematics). I agree with French Fancy about your lie. Thanks for my award, I'll post about it in a couple of days. Good luck at LBF and with your meeting with the publisher. I look forward to hearing all about it. That's been the story of my life, I get work delegated to me, whilst others get awards. Oh well! Good luck on Tuesday, fingers crossed that they snap up your novel. Tell them Troys says "publish and be damned…lucky". I'm really struggling to guess which one is the lie – I think I agree with ALL the commenters above. Thanks DJ Kirkby! Sorry your vacation's ending, but that's nice about the Blue Chrome event. Thanks for the award, Deej, I really appreciate that. Best wishes for your meeting with the publisher too, I hope all goes well. Thanks for the award! And I thought it was the youtube channel too… so I can't guess at all now. Oh that's a shame. You're hiring staff? About time you got some help! I'm going to struggle to fit it all in too 'cos I won't get there 'till around 12 and have to leave in time to get home to give Werecat her insulin at 7pm. The whole day is going to be hectic but woth it I hope. Someone in the comments has guessed correctly. I'll let you know the correct answer on Tuesday evening. I reckon its the writing course one. I'll try my best to do this Deej! Thank you for "tagging me"! I've seen this one around a bit and thought it looks fun. I probably won't get a chance to post about it before the weekend. Oooh hope it all goes well at the LBF. The Bluechrome event sounds great. Wish I could make it but I can't unfortunately. Oooh – good luck with it all. I'm looking forward to your answers, I reckon they'll be hilarious. The weekend is good for me as that is when I go round catching up on blogs anyways. Ooooh you have the most FABULOUS name ever. It is perfect to go on a book ocver! Blimey, Den, how my eyes deceived me – I could have sworn it said Maths. So I reckon it's the daughter one for sure now. I'm sending some positive energy across the ocean for "Without Alice". This book needs to be published!